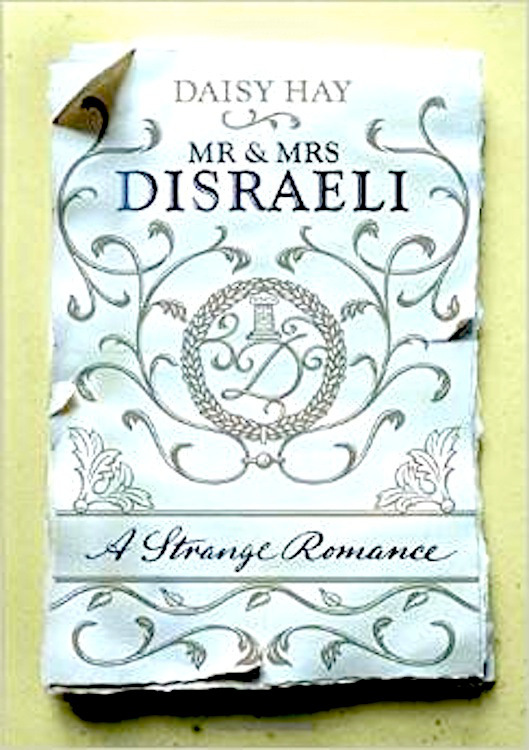 [A Review of] Daisy Hay's "Mr & Mrs Disraeli, A Strange Romance"
The illustrations here, except for the first one of the book cover, have been added either from our own website or the Internet Archive. Click on them for larger pictures, and for more information where available. — Jacqueline Banerjee. Biographies of Victorian couples are not unknown. To take two not quite at random, James Covert wrote A Victorian Marriage, Mandell and Louise Creighton which was published in 2000 and William M Kuhn wrote Henry & Mary Ponsonby, Life at the Court of Queen Victoria which was published in 2002. Mandell and Ponsonby were both significant figures but neither matched the prominence of Benjamin Disraeli. Kuhn's and Covert's books deal with the lives of their subjects as much as the marriages. Daisy Hay has written a book which deliberately concentrates on the marriage itself although inevitably one learns something of the lives of the couple along the way. She has written a book about their relationship rather than a book about two interesting people who happened to be married to each other. Disraeli, of course, has been the subject of distinguished biographies and Mary Anne has been the subject of two books though not so ambitious as those about her husband. The basis of the book is 10,000 items in the Disraeli archive at the Bodleian which have been neglected by previous scholars who have worked on the archive. The items had little attention because they were to do with Mary Anne herself rather than Benjamin. Hay highlights the irony because the other 40,000 items as well as the 10,000 are only available because of Mary Anne's habit of retaining papers including many that others might have been inclined to destroy. She kept them in good order. It is a good story. Disraeli got to know Wyndham Lewis and his wife in the 1830s and he won the second seat at Maidstone for the Tories in 1837 where Lewis had been established as an MP for some time. Lewis died the following year leaving his widow, Mary Anne, with an income of £5,000 per annum for her lifetime. Less than 18 months later, on 28 August 1839, she became Mrs Disraeli. He was deeply in debt and 34 years old. She had a well-furnished house on Park Lane as well as the income and was at least 46 (no-one can be quite confident about her true date of birth). There is no doubt that Disraeli was after the money. The marriage went through a prolonged rocky patch in the late 1840s and into the very early 1850s. Mary Anne's background was not the best preparation for mixing with Royalty, the aristocracy and the literary world. She was anything but dull but her conversation and her dress tended to be too eccentric to make life comfortable for Disraeli. She was not as skilful at fitting into a world in which she had not been brought up as Disraeli himself. 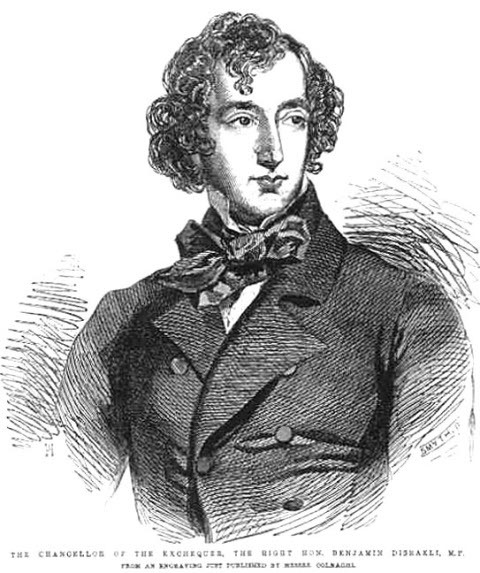 Left: Disraeli in 1852, an engraving by Smyth in the Illustrated London News. Right: Mary Anne Disraeli, Viscountess Beaconsfield (from the portrait at Hughendon Manor). Photograph by J. P. Starling, High Wycombe. Source: Meynell, facing p.60. Despite these handicaps the marriage survived and thrived. Money was the least of what she provided. It quickly became clear that she didn't have enough to cope with his large debts and continuing needs. His financial difficulties and his efforts, occasionally unsuccessful, to keep from his wife their true scale were the source of much of the tension in their relationship. Until he had a Ministerial pension of his own and inherited capital from Mrs Brydges Willyams in 1863, they were never free from anxiety about money. 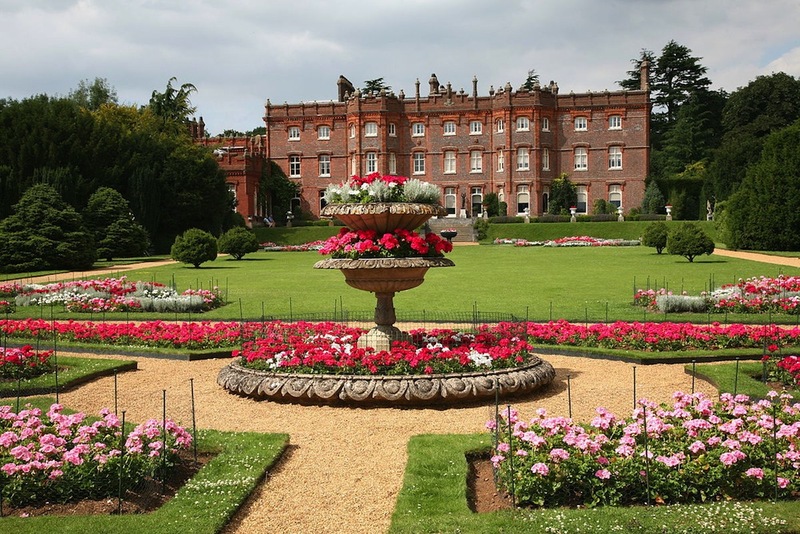 The reasons for the marriage's success seem to be have been that she was supportive in every way, providing good company, love and appreciation, well-managed homes in London and at Hughenden and appropriate hospitality to those he needed to cultivate. As well as bringing wealth into the marriage Mary Anne was committed to making their money go as far as possible. Her treatment of their staff was guided by this principle and it emerges as the least appealing feature of her personality. She sought advice from Lady Blessington about how to economise without its being obvious. For Mary Anne the advice did not go far enough. She paid the domestic staff nearly a third less than Lady Blessington recommended. When she went away the staff were not well treated which meant that the Disraelis could live more cheaply in hotels in Europe than they could in London. She handled staff firmly to the end of her days. On recovering from a prolonged and serious illness in 1867 she sacked the lady's maid whom she judged had neglected her on her sick-bed. Hughenden, the Disraelis' country estate in the Chilterns. Photograph by Hans A. Rosbach. Some, for example a young Lord Roseberry, were not put off by her social eccentricities and greatly appreciated her warmth and perceptiveness and the quality of her conversation. She had a long and close relationship with Charlotte Rothschild and, after some rocky passages, was well-treated by Queen Victoria. The longer the marriage lasted, the happier and the more fulfilling it seemed to be. The sincerity of some of Disraeli's flattery may be doubted. Hay quotes a letter from Paris to his sister but intended to be seen by his wife: "MA. made a most brilliant toilette last night...Indeed I passed her off as my daughter & she found many admirers." He was clearly polishing the skills that helped him later with the Queen. Despite this excess, which Mary Anne may well have understood but still enjoyed, the evidence is compelling that he became devoted to her. During her only visit to Knowsley, the seat of the Earl of Derby who at the time was the leader of the party, she irritated the host who humiliated her publicly. Although it can hardly have been in his political interest, Disraeli refused ever to go to Knowsley again. When he was defeated at the polls by Gladstone in 1868 and stood down as Prime Minister he was offered a peerage which he refused but asked that Mary Anne might be made Viscountess Beaconsfield in her own right. The Queen agreed and, rather than provoking humour and scorn, the honour seems to have been warmly welcomed by the press and by society generally. 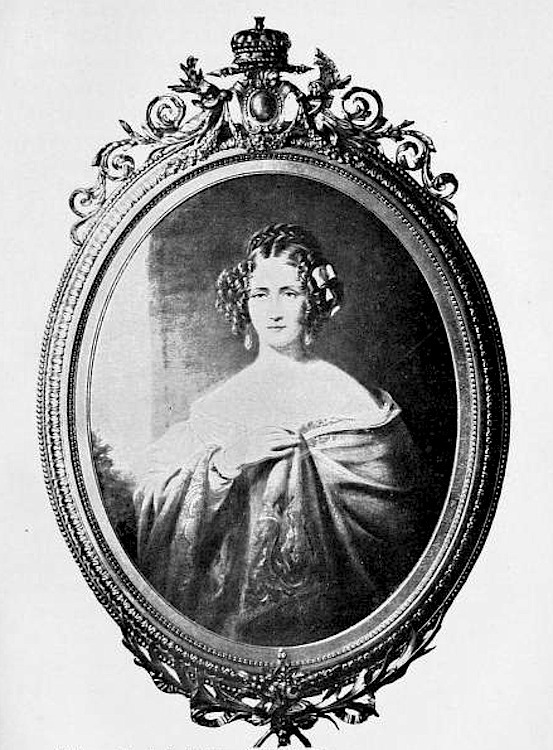 Mary Anne died in 1872 and was buried at Hughenden after a very quiet and small funeral. 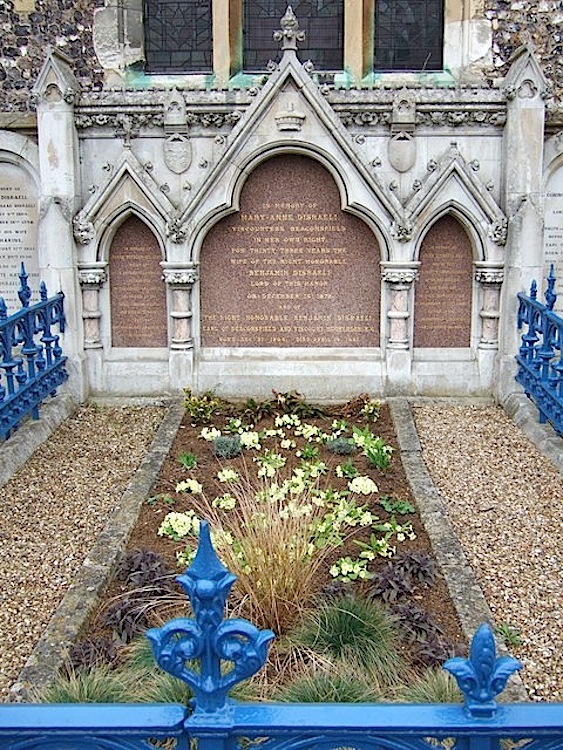 When her husband, by then Beaconsfield, died in 1881, his will read "I desire and direct that I may be buried in the same Vault in the Churchyard of Hughenden in which the remains of my late dear Wife Mary Anne Disraeli created in her own right Viscountess Beaconsfield were placed and that my Funeral may be conducted with the same simplicity as hers was." His wishes were followed. The Disraelis' family vault at Hughenden Church, where the couple were buried. © Rob Farrow. The good story is well told and accompanied by 24 well-chosen if slightly small illustrations. Hay lectures in English Literature and Archival Studies. Her previous book was Young Romantics: The Shelleys, Byron and Other Tangled Lives. It is perhaps unsurprising that she tackles Disraeli the novelist with more obvious relish than Disraeli the politician. An unusual and not entirely successful feature of the story-telling is that nine of the ten chapters begin with a page or two on the life of one or more people not directly related to the central story. The stories are drawn from the archive, were known to Mary Anne and seem to be intended to demonstrate the pitfalls which the Disraelis managed to avoid by the way they led their lives. The distraction seems scarcely justified by the limited light they shed on the main story. That story is a valuable addition to what we know of Benjamin Disraeli and in its own right an account of a rich and unusual marriage between two unusual people. (Book under review) Hay, Daisy. Mr & Mrs Disraeli, A Strange Romance. London: Chatto & Windus, 2015. Hardback. £20.00. xii + 320pp. ISBN 978-0701189129. (Illustration source) Meynell, Wilfrid. Benjamin Disraeli: An Unconventional Biography. New York: Appleton, 1903. Internet Archive. Contributed by the University of California Libraries. Web. 1 April 2015.